Leading off today: I'm not a big fan of the "commitment reveal" ceremony embraced by many high school senior athletes. For the uninitiated, it typically includes having the player sit at a table with baseball caps from his or her two or three finalists. They then announce their college choice by picking up the corresponding hat and wearing it for the remainder of the ceremony. It's both a major cliche and a bit disrespectful toward the losing suitors. On the other hand, the college "scholarship reveal" in which a third- or fourth-year walk-on is surprised with a scholarship is pure joy. Coaches often work up elaborate plans for the announcement in front of the recipient and his or her teammates. In one instance a couple of years ago, Notre Dame sprang the news on a football player who thought he was in the meeting room to model a special uniform to be used in the upcoming season. There was another one of those reveals in the major-college ranks on Saturday -- and it involved a former Pittsford lineman who was first-team all-state in 2013. In 2014, @BigCShu71 started a foundation to help kids like Maiya. Today, Mayia helped us share a special message with Charlie! ?? When he was in high school and an Eagle Scout in Pittsford, Charlie Shuman helped create the Big Helping Little foundation as part of a project for the National Honors Society. The foundation helps young children battle rare diseases and was inspired by his friendship with a little girl named Maiya Colon. Colon was born with progressive osseous heteroplasia, a genetic abnormality that causes bone to form in unusual places such as muscles and skin. The family has had to travel extensively to Philadelphia to see pediatric experts, which has been a financial burden. The child's parents reached out to Penn State head coach James Franklin about coming to watch a team practice. Franklin used their visit as an opportunity to surprise Shuman, a little-used lineman highly respected by teammates, about his new football scholarship after four years of walk-on status. Blazing start: Kelsey Chmiel of Saratoga opened her senior season with a 90-second victory on a 5K course to spark her team to first place in the Great Meadow Invitational in Virginia. Chmiel clocked 16:44 to eviscerate her own course record of 17:36. Saratoga freshman Ella Kurto placed sixth. Starting 'em young: When I think of male high school athletes, I'm generally picturing juniors or seniors -- the core of nearly every varsity team. Freshmen and sophomores certainly play a role, too, but middle-schoolers are a rare commodity -- especially in the large-school ranks. That's why a soccer note from Saturday caught my eye. Seventh-grader Nathan Hohl, who's just 12 years old, recorded the shutout for Class AA Frontier in its 7-0 victory vs. Cheektowaga in the championship game of the ADPRO Frontier Alumni Kick-off boys soccer tournament. 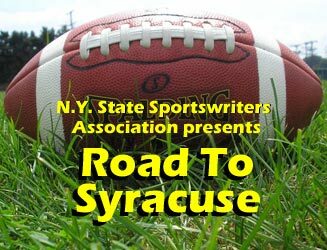 Football development: Aquinas may still be the favorite in Section 5 Class AA based on the amount of experienced returnees, but the Little Irish will have to make a go of it with a pair of sophomore quarterbacks after Jon Kloch decided on the eve of fall camp to not play this fall. Kloch threw for 13 TDs and more than 1,200 yards as a junior while sharing time with then-senior Jonathan Parrinello. That makes Thursday's opener between Victor and Pittsford a bit more important than it already was in the Section 5 large-school landscape. File this for future reference: Arizona high school students will compete for a state championship in video games this winter, the Arizona Interscholastic Association announced last week. The AIA, which will label the competitions as activities rather than varsity sports, will run three-on-three competitions in "Rocket League," a game of vehicular soccer, and five-on-five competitions in "League of Legends," a multiplayer battle game. Beginning next year, the AIA will shift to two esports competition periods each academic year, in the fall and spring seasons. The contests will be sanctioned by the National Federation of State High School Associations, which announced a partnership with PlayVS to build a platform for high school competition. Colleges have already embraced esports in a big way. Syracuse.com reporter Donna Ditota did an in-depth piece last week about the online gaming community at SUNY Canton, which has budgeted $500,000 to construct a state-of-the-art game room. Canton's esports team competes with other colleges and universities on a virtual playing field and is operated as part of the athletic department. The Kangaroos will hold team tryouts this week to begin preparations for their matches organized by the Eastern Collegiate Athletic Conference and the National Association of Collegiate Esports. Extra points: Joe Amelio is the new boys basketball coach at Scarsdale. He previously directed the Varsity B team at St. Raymond's.